Nocino is a complex, nutty, and slightly bitter dark-brown liqueur that is usually served as an after-dinner digestivo. Nocino can also be used to “correct” a shot of espresso (espresso with a shot of liquor is called a "caffè corretto," or "corrected coffee"), poured over gelato, mixed into cocktails, or used in place of vanilla extract in baking, especially when making biscotti. Made from unripe green walnuts (noci), the beverage is commonly associated with the date of June 24 (the Feast Day of San Giovanni, the patron saint of Florence) because traditionally that was the day when the walnuts were gathered for making the liqueur. Most commercial versions of nocino contain artificial caramel color and flavoring and are not true infusions from fresh walnuts—so it's really worthwhile to make your own. Though it can be tricky to track down the green (sometimes known as "wet") walnuts, once you've got them, the rest is simple and mostly hands-off—it just requires some patience, as it takes time for the final results. Green walnuts are only available for a brief time every June, so while you don't necessarily need to make them on San Giovanni's feast day, the window of opportunity is limited (besides walnut liqueur, they are also used to make pickled walnuts). If you happen to live in a place where walnuts are grown, you can try buying them directly at a walnut farm. Even if you've had a walnut tree and helped with walnut harvests, you may never have examined a green walnut up close. 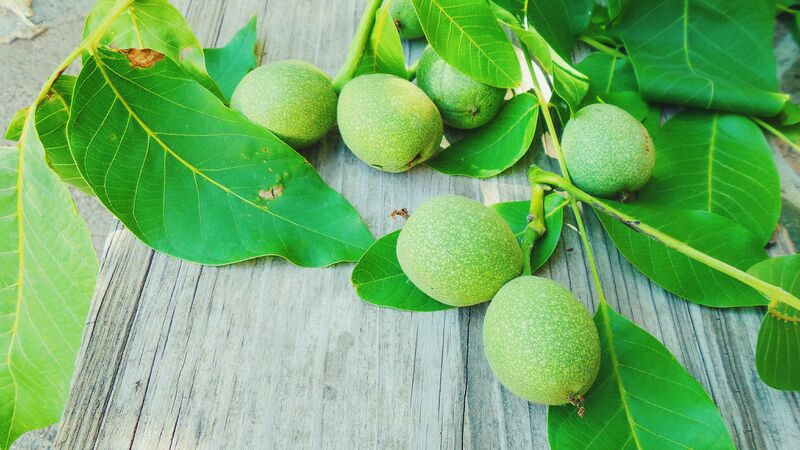 When sliced in half, the unripe walnut is clear, with a jelly-like texture. It can look like a tiny, translucent brain. 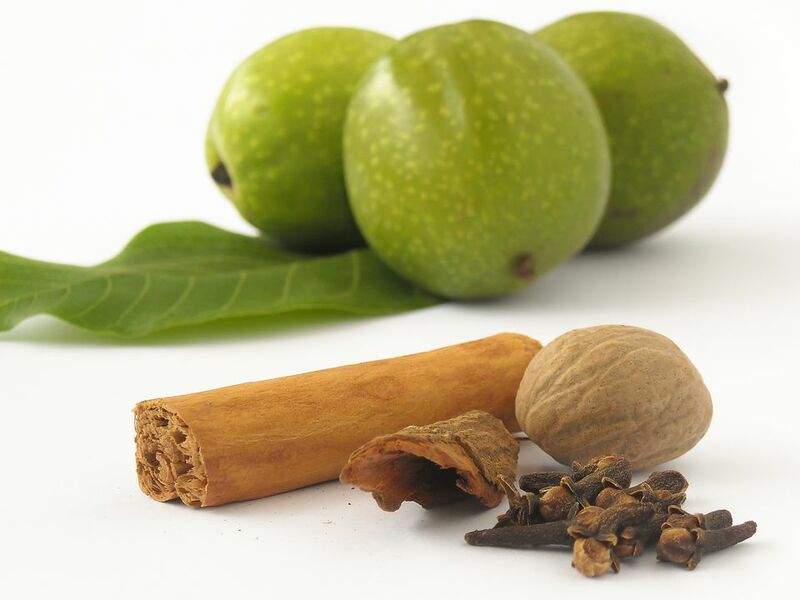 Recipes for nocino vary widely depending on the spices used. Some add juniper berries, vanilla beans, or orange zest. These instructions are very sparing with spices since a good nocino doesn’t taste strongly of any individual one. The green walnut flavor should predominate: nutty, slightly bitter, a touch oaky, a bit vanilla-y, and sweet. It's a good idea to wear disposable rubber gloves for this part, or the walnut juice will stain your fingers and nails yellow. If you don't clean your nails, the stain later turns dark brown. After rinsing and drying the walnuts thoroughly, use a sharp chef's knife to halve the walnuts lengthwise. Halve each half again to form quarters. Note that they might be a bit difficult to cut, even though the immature shells lining the inside of the green husks should still be quite thin. Place all ingredients (except the simple syrup) in the glass jar and pour in the Everclear. Close the lid tightly and give the jar a good shake to distribute the ingredients. Let it sit in a cool, dark place for 30 to 40 days. You can give the jar a little shake every now and then to redistribute the ingredients. Most recipes for nocino instruct you to leave it in a bright, sunny spot to macerate, but that seems counter to all logic about infusing liquor. Light can degrade and destroy flavor and aroma compounds, it is better to store the jar in a cool, dark cupboard. Within a few hours, the walnuts will oxidize and turn black (particularly any that were above the water line). Add simple syrup and shake well. Return the jar to a cool, dark place and let it sit for another 30 to 60 days. Finally, strain out the solids and your nocino is done. Most people advise letting it sit for about 40 days before adding simple syrup, then letting it sit for at least another 30 days before straining out the solids. At that point, it is technically ready to drink, but common wisdom (and the Order of Nocino Modenese) dictate that to really get something special, you need to let it age and mellow for at least a year, or better yet, two.